It's a crisp Thursday night in late summer, what are your plans? Why not save your workout for after work and join us and a couple thousand of your running friends in Downtown Salt Lake City Near the Capitol? Start by running the Wasatch Mile, 1-mile road race, and stick around to watch the Elite Invite only Wasatch Mile race where professional and semi-elite runners will be competing for some big prize money and the Wasatch Mile Belt Buckle Trophy. Then join a team or run as an individual in the Company Cup 5k. The Wasatch Mile will allow milers of all ages and ability levels to compete against the clock to run a road 1-mile race. Medals will be given to the top 3 in each category. 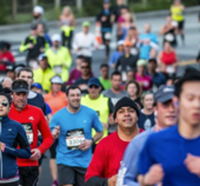 The Company Cup 5K (3.1 miles) is a workplace-focused fitness promotion that starts off with a 12-week training program and culminates in a Downtown Salt Lake City, Corporate 5K Run/Walk, and Networking party. The Company Cup 5K and health and wellness program is designed to promote health and fitness among Utah Companies and their employees. A portion of the proceeds benefits the Utah STEM Action Center. You can sign up as either a team or an individual. If you are signing up as a team, the team captain must first set up the team. Then, employees (or family/friends) sign on as part of a company team. Each team can have as many members as it wants, but only the top 4 runners will score for each team. Participants receive a 12-week turn-key training program once they register which includes training schedules, diet advice, injury prevention, and behavior modification/sports psychology tips along with discounts and more. The program culminates at City Creek Center on Thursday, September 22, 2016, at 5:30 pm with a pre-race networking party followed by a 1-mile invite-only race and then the Company Cup 5K Run/Walk. Team categories are Men, Women, and Co-ed (Men and Women Mixed) and prizes will be given to the top 3 in each category. The races will be age-graded based on USA Track and Field guidelines to make it an equal playing field with teams of individuals who are in different age groups. Individual awards will be available for the top 3 overall male and female runners. Prizes will also be given away for best company t-shirt design. The Thursday, September 22, 2016, Company Cup 5K Run/Walk and wellness program and the Wasatch Mile will attract participants of all levels of fitness (walkers, joggers, and competitive runners) from companies all over the Wasatch Front as well as hundreds of individual participants. No matter the size of company you work for, or if you work for a city or the State, a school, or if you work from home or are self-employed, you won’t want to miss this event. This fitness program is designed to get you in the best shape possible for running the 5K event. This race will sell out, so don't hesitate to get registered and join us. Same-day race registration and networking party go from 4:00 pm to 5:25 pm. The post race awards ceremony and after party goes from 7:45 pm to 9:30 pm. This all takes place during Salt Lake City Dine O'Round, so be sure to plan on staying after in order to grab something to eat at one of the many great restaurants in Downtown Salt Lake. Location: 500 North and E Capitol Ave at Bonneville Blvd near the State Capitol.